Really feeling the wet paint and ink on your fingertips is almost like becoming free of the seriousness of adulthood, the release from the burgeoning stress we all carry with us. A freshness of our mind. Whilst I was at college, one of my favourite parts of the Art & Design course was the printing. Etching plates, Lino printing, Screen Printing and the smell of Swarfega when cleaning up. I’m not such a girly girl that getting messy bothers me so when Phoebe was looking at things to incorporate into her GCSE portfolio (takes me straight back to my days again) I suggested we visit Alan Birch and his print studio in Waterfoot, Rawtenstall. Alan runs workshops in printmaking and was really welcoming when we arrived. 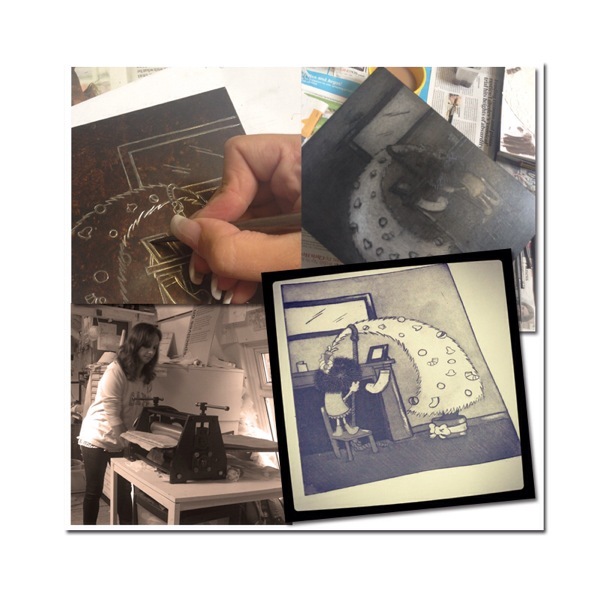 We went straight into etching plates, preparing the images for the aquatint process after printing an initial line print from the plate. It seems very strange seeing an illustration of mine that I would have usually created digitally on the side of an aluminium plate. Surreal enough to be enchanting me into wondering what my next image would be. Through the process of inking up the plates using the scrim to wipe off excess ink, approaching a more vigorous arm movement to lessen the contrast in the colours, it becomes a process of trying to gage what level of ink will produce the best results. This is the novelty to me in producing an image that I’m not sure what it will look like. Digitally this creates no issue with the final piece. However the fascination with getting it just right was entrancing me. Traditional printing gives completely different results to the computer and the fact that any marks you make cannot be undone. A scary thought that I only clocked onto after I had started printing my designs. Throughout the two days I was in awe of the artists busying away on different prints. All extremely entertaining with stories of how printing has become a part of their life, how the process is as fascinating in the final proof as it was for me regrasping a skill from my earlier years. The final prints came out ok. Although like any creative I am critical of my workings constantly trying to analyse the areas for improvement and the collagraph printing which was less memorable from my courses as the acid baths and etching plates turned out better than I expected. These are definitely a couple of techniques I’m going to get the illustration students to try out when I delve back into the teaching world this Autumn. There seem to be a consensus of opinion that digital will become less popular and the quirks and imperfections of traditional illustration will come back into the realms of our methods. Lets see if I can master the printing approaches before it all changes shall we? I definitely think I’ll be going back for another session in the print studio at Prospect Studios.